Junior Certificate students attend from 9.10 a.m. to 4.00 p.m. Monday to Friday except Wednesday when class finishes at 3.20 p.m.
Senior Students - Transition Year and Leaving Certificate (5th and 6th Year) - attend from 9.10 a.m. to 4.00 p.m. Monday to Friday except Wednesday when class finishes at 1.20 p.m. Girls may not be absent from school or leave school early except in the case of illness or with permission obtained from the school. In the case of absence, students upon return to the school must present written notes from parents/guardians. Participation in major school community activities, for example, the Opening Mass for the school year is expected. Each student will be required to purchase a student card which will have her photograph, name, date of birth, student number and P.P.S. number. 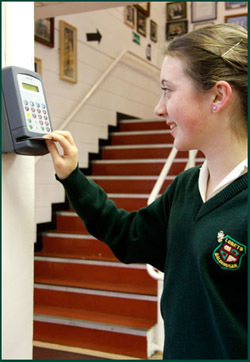 Each morning and afternoon the student passes her card through one of the three scanning devices located in the foyer. A student who forgets her card will come down to the office at 9.20 a.m. and her code will be manually keyed in. This will be registered as late. If a student swipes another student’s card in, it will be regarded as a serious breach of discipline and punished by detention. If a student is absent the system will automatically text message her parent’s mobile. Lost cards will be replaced at the cost of €10.